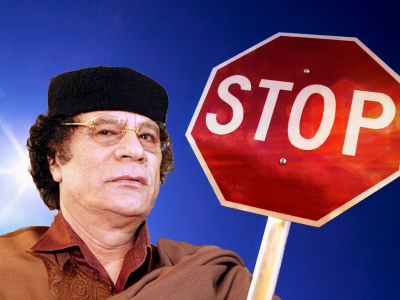 As Tripoli continues its brutal crackdown against anti-government forces, Libyan strongman Muammar Gaddafi condemns the West while casting his gaze eastward in search of allies. ­In an occasionally rambling interview with RT, Gaddafi points to a number of enemies conspiring to unseat him, including Western powers, global media and even the preeminent terrorist mastermind himself, Osama bin Laden. Indeed, the eccentric Libyan leader seems totally incapable of understanding that there are Libyans on the streets protesting against his 30-year reign. “In Libya, power belongs to the people,” he said, adding that the uprisings were “imported” from abroad into his African nation of some 6.5 million souls. Libya, which ranks as one of the 10 richest oil-producing nations, comes in first place amongst African countries in the Human Development Index [the HDI is a comparative measure of life expectancy, literacy, education and standards of living of countries around the world]. With its abundant oil reserves and relatively low population, the North African state is able to maintain higher standards of living as compared with its neighbors. In Egypt and Tunisia, for example, where the leaders were forced out of power in the wake of public uprisings, people took to the streets after enduring many years of grinding poverty and leaders that seemed out of touch. Gaddafi cites the differences between Libya and "failed" Arab states when he argues that his people would never rise up against him. 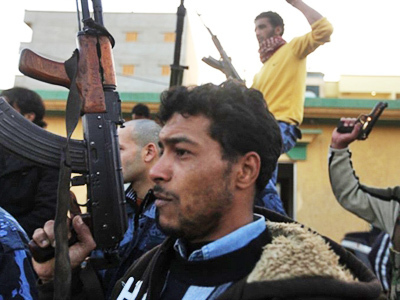 The Libyan attacked media reports, saying that “several hundreds” were killed as opposed to the thousands that have been cited by some journalists, even suggesting that Al Qaeda may be feeding news agencies false news reports. Moscow on Thursday said the draft resolution to declare Libyan air space a no-fly zone leaves various questions unanswered, while expressing reservations that such a resolution would resolve the political crisis. "What mechanisms of control over the enforcement of such a decision would be prescribed, who would enforce it, with what resources, in what form? None of these questions has been clarified yet," Foreign Ministry spokesman Alexander Lukashevich told a briefing in Moscow, as reported by Interfax. "All these questions are being worked on at the UN Security Council," he said. "Before these questions are clarified, it is very difficult to make any further moves." Despite increasing international pressure, Gaddafi remains defiant while expertly playing the victim card: declaring that the Libyan people have been ordered to fight against his government, while the western media misrepresents the situation, the veteran leader is attempting to turn public opinion in his favor. 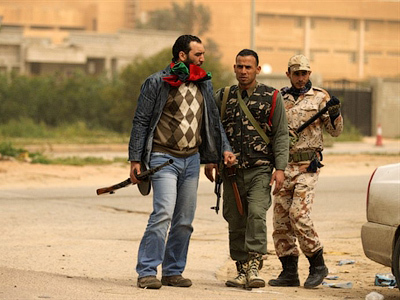 Since few people are buying Gaddafi’s story outside of Libya, the Libyan strongman has cut all ties with the West, while hoping to find support in the East. He even was shrewd enough to toss in the promise of some potential revenue from future oil projects in return for friendship. "We do not believe the West any longer, that is why we invite Russian, Chinese and Indian companies to invest in Libya’s oil and construction spheres,” Gaddafi told RT. He then lashed out at the Western powers, saying Germany was the only country with a chance of doing business with Libyan oil in the future. 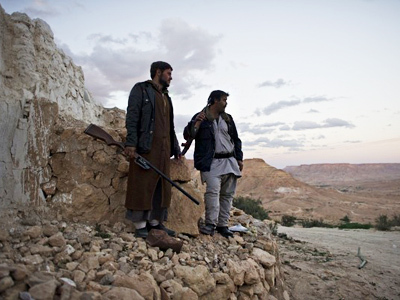 “We do not trust their firms – they took part in the conspiracy against us." 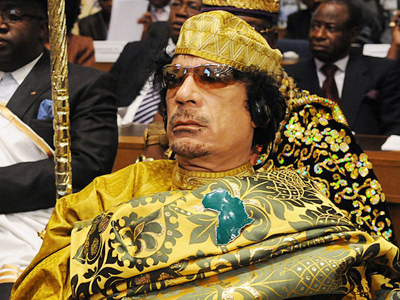 However, it will take a lot more than the promise of some oil revenue for Gaddafi to win over international opinion. To demonstrate how deep global opinion has turned against him, even the 22-nation Arab League has called on the UN Security Council to enforce no-fly zones in Libya. Losing the support of the Arab League, of which Libya is a member, underscores exactly how far Muammar Gaddafi has isolated himself on the international stage. Although he may be able to eventually quell the anti-government attacks against his government, his standing as a global leader, which was always a matter of much debate, will never recover from this massive setback. Unfortunately, Gaddafi’s incredible sense of self importance does not allow him to understand the situation in its entirety. It does not allow him to see that, for Colonel Muammar Gaddafi, the game is up.